The Kremlin is considering options to replace the Antonov An-124 Ruslan heavyweight airlifter for Russian military and civil operators. The new aircraft would be produced at the older type’s manufacturing line at the Aviastar-SP factory in Ulyanovsk. TsAGI—the Russian acronym for the Central Aerohydrodynamics Institute—is offering a concept referred to as Slon (elephant). It features a new wing made of composite materials with a higher aspect ratio and a gross weight increase to 490 to 500 tonnes, of which 214 and 222 tonnes are the weight of the structure. The proposal was announced at MAKS’2017, but shortly after that United Aircraft Corporation (UAC) denied having any firm plans relating to the new aircraft. Despite this, TsAGI has been detailing the initial concept. Last month the institute issued a statement that it had completed shaping an aerodynamic layout of a future freighter and made a scale model for wind tunnel testing, scheduled to be undertaken in August-September 2019. The intended Ruslan replacement remains a high-wing monoplane with four turbofans on wing pylons and bears a passing resemblance to the Antonov design. It will be able to transport 150 tonnes of freight over 3,800 nm, or 180 tonnes over 2,650 nm at a cruise speed of 460 knots. Instead of using the Ukrainian-designed and made D-18T turbofans, the Slon would be powered by indigenous PD-35s being developed for the Sino-Russian CR929 jetliner, which produce 35 tonnes of thrust compared to 23. 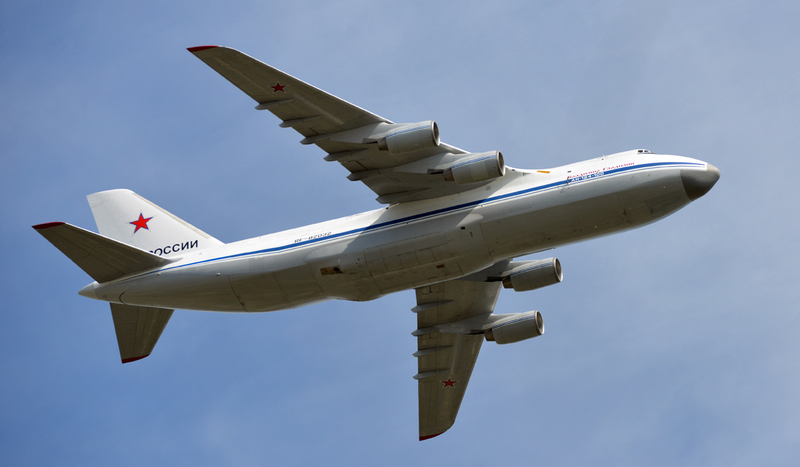 Lower fuel-burn provides for a two-fold range increase compared to the An-124-100-150M, which can haul 150 tonnes to 1,675 nm or 80 tonnes to 4,600 nm. The Slon has larger dimensions: length is 270 feet (82.3 meters) versus 227 feet for the Ruslan, height is 78.7 feet compared with 68.9 feet, and wingspan between 286 feet and 290 feet versus 240.5 feet. There are two versions of fuselage mating a universal wing, one shaped to the requirements of the Russian MoD and the other to that of Volga-Dnepr Airlines. The military demand includes carrying infantry fighting vehicles in two lines along the cargo cabin, which dictates a cabin width of 21 feet, whereas Volga-Dnepr requires a width of 17.4 feet as opposed to 14.4 feet in the An-124. The MoD’s specification calls for a range of 4,100 nm with 300 armed soldiers plus 100 servicemen making up the crews of five Sprut SDM-1 air-transportable lightweight tanks.